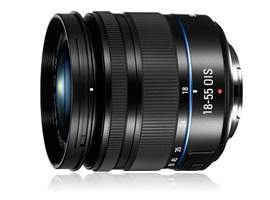 Samsung NX 18-55mm F3.5-5.6 OIS III lens review: Value option? As one of the least desirable models in a camera maker’s range, the kit lens is usually the first experience users have of the brand. This is a revised model that’s bundled with the maker’s high-end NX300 and the new NX30 so expectations are high, but it is also available separately at around $220. Although plastic is used for the outer it has a metal mount and is relatively well made by comparison to some of the bigger well-known brands. It has 12 elements in 10 groups including one aspherical element, though the total number in includes stabilization optics. Like other models from the maker the 18-55 (28-85mm equivalent) f3.5-5.6 OIS III includes the firm’s innovative i-Function option allowing quick and simple selection of a number of camera features, such as EV shift, ISO and more using the focus collar. Although compact measuring 2.48 x 2.56″ (63 x 65.1 mm), it’s not quite as small as the firm’s collapsible 20-50mm f3.5-5.6, which has been bundled as a kit lens in the past but at 7.20 oz (204 g) it’s relatively light in weight. The lens achieved a DxOMark score of 13 points overall and a fairly typical score for a lens like this. 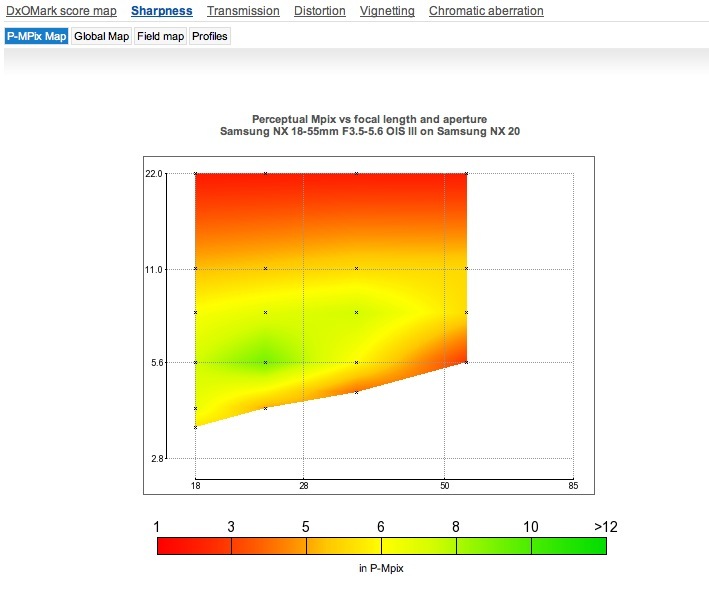 A peak sharpness score of 8-Mpix is also around the expected value, given the 20-Mpix sensor of the NX 20. Like many zooms we see, this one is sharper at the wider-end of the zoom range and it requires stopping down a little from the initial aperture as it’s a little soft, particularly in the outer field. Barrel distortion is noticeable at 18mm but this falls away rapidly although it changes to pincushion from 35mm through to 55mm. Apart from low sharpness with zooms, vignetting and chromatic aberration are arguably the most troubling for kit zooms like this, but again Samsung has done very well to minimize both. Optimum sharpness is achieved at 24mm (35mm equivalent) f5.6. 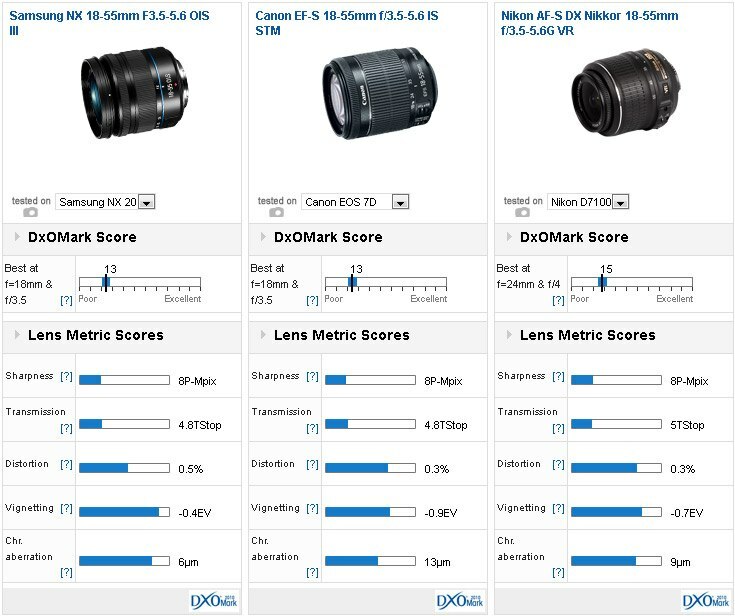 Compared to two retrofocus type zoom lenses intended for use on DSLRs, the Samsung scores comparatively well. It’s similar in peak sharpness to Canon but that model has acceptable sharpness at full-aperture and better uniformity, which is more practical in models like this (even if they’re equipped with stabilization). Both have near identical distortion at 18mm but the Canon reveals barrel distortion to 28mm and has only the barest trace of distortion from 35mm onwards. That lens also has more noticeable chromatic aberration, particularly at the wider end of the zoom range. When analyzed against the earlier Nikon AF-S DX Nikkor 18-55mm f3.5-5.6G VR (2007 version), the Samsung has similar levels of peak sharpness. It’s possible the Samsung may have some in reserve with a higher resolution sensor, but the Nikkor has slightly higher overall sharpness. 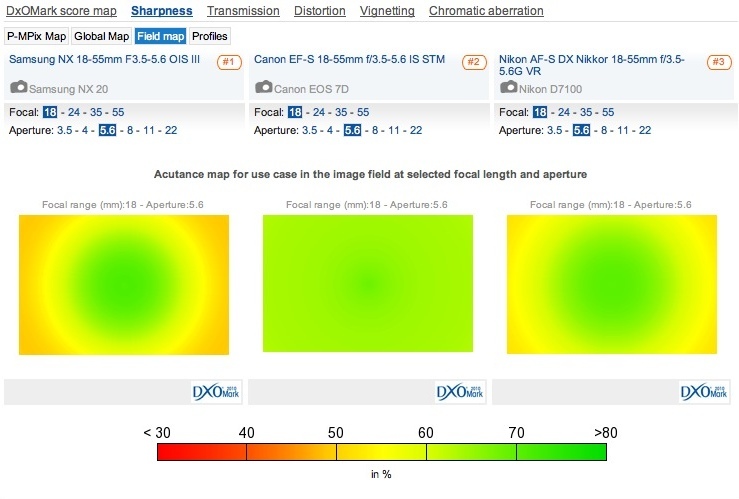 The Nikkor also stands out for its distortion correction. Admittedly at 18mm it has a similar barrel type distortion to both the Canon and the Samsung but from 35mm onwards the Nikkor has no measurable distortion at all, which is unusual in a lens like this. The Nikkor also has well-controlled vignetting but it’s not low as the Samsung, which has only a slight trace at the shorter focal lengths. The use of ED glass shows at the longer focal lengths as lateral chromatic aberration is very low from 24mm onwards and it’s still quite low at 18mm, though it’s noticeable in the extreme corners. All three have similar peak sharpness but the Canon has better sharpness overall, with most of the gains made in the outer field. While it’s good see makers like Samsung improve the build quality and concentrate on adding innovative features with kit lenses like this lens, there is some room for improvement in optical quality. The performance isn’t bad by any means, considering the price, but sharpness is a little low wide open throughout the zoom range and uniformity isn’t quite on a par with the best of the rival options.